David Haire followed up his hat-trick at Bishopscourt on Saturday by securing a treble of wins at the Kirkistown short circuit meeting on Easter Monday. 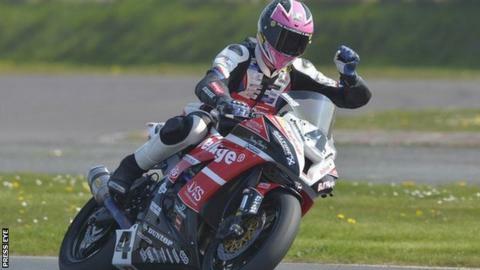 Haire won the opening Supersport race by half a second from Keith Amor, with Carl Phillips in third position. The Lisburn rider then triumphed in Superbike race one, ahead of Athlone's Cody Nally and Manx rider Dan Kneen. Nally beat Haire by 0.002 seconds in race two but Haire then took victory in the second Supersport 600cc event. Amor again finished second, with Phillips again completing the rostrum and Jason Lynn, Conor Parkhill and Nico Mawhinney completing the top six. Mawhinney, Lynn and Christian Elkin made up the top six leaderboard in the opening 600cc joust. Kawasaki-mounted Haire had 3.770 seconds to spare over Nally in the first Irish Superbike outing, with Wilson Craig Honda rider Jamie Hamilton fourth, Denver Robb fifth and Stephen Thompson sixth. The second Superbike race saw Kneen occupy the final step of the podium, followed by Hamilton, Robb and Thompson. Amor took the flag in the two Supertwins events, with Kori McGreevy runner-up and Mark Hanna third on both occasions.